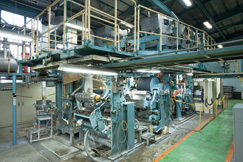 Nippon Paper's Test Plant is equipped with testing equipment spanning all processes from pulp preparation and papermaking to coating and finishing. Representative items of equipment are introduced below. 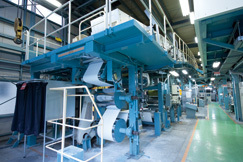 This paper machine enables papermaking using either a single fourdrinier horizontal wire or angled wire with a small basis weight, as well as papermaking using both types of wire with a large basis weight. 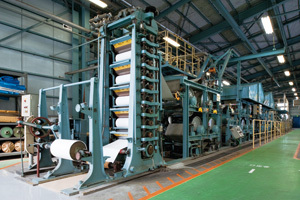 With it, we conduct a variety of papermaking tests papers including mechanical wood-containing paper, wood-free paper, filter paper, specialty paper. In addition to a general blade coating head, the No. 1 test coater has contour coating heads including a curtain head and a spray head, enabling transfer-type gate roll coating. 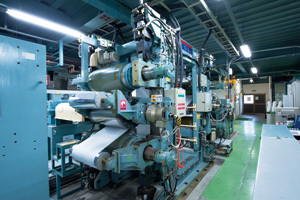 With this equipment, we conduct coating tests mainly aimed at new product development and at confirming the coating applicability of the many coated papers produced by the Nippon Paper Group. By passing paper between the metal heat roll and the elastic roll made of resin, we are able to improve paper smoothness with little increase in density.